Today I have a quick New Years Eve mani to show you. 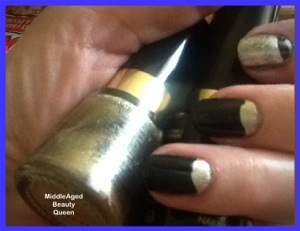 This is a half moon manicure using Gold Coin and Knockout, both by Revlon. To start, paint your nails the color you want your moon to be. In this case I used Gold Coin to pain my nails. I did paint one opposite, and painted the entire nail black. When dry, I then painted the “moon” using Knockout, or any black, I painted all but the moon part of my nails, leaving a bit of the gold peeking out. Of course I have to have one odd nail, so that one is painted with the gold and a bit of the black peeking out. Of course, you have to remember I painted this free hand, you can use some guides or even scotch tape to mask off the area you want for your moon. This would give a much cleaner look. Also, you could use any color combination. I like the black/gold, but black/ silver or red would be pretty. I also like the idea of blue with silver. One last tip, be sure to use a good base coat when working with dark colored nail polish, and have a clean up brush handy. I wish everyone a very HAPPY NEW YEAR. I sincerely hope 2013 brings you everything you need and want to live your life to the absolute fullest. 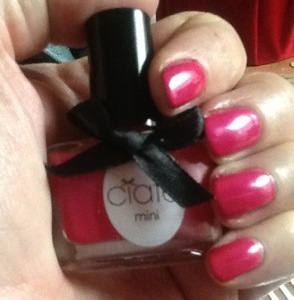 Ciate Cupcake Queen ~ #1 Mini Mani Month Calendar. 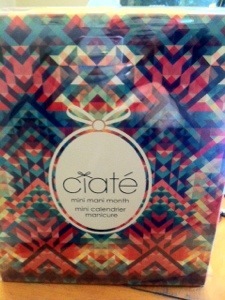 Ciate Mini Mani Month is an “advent calendar” with little, teeny, tiny bottles of nail polish behind the doors. Today I have on the #1 door, Cupcake Queen. . This is a hot pink with a bit of a purple duo-chrome. I love this color. This has to be one of my favorite nail colors. I used to only wear a typical French manicure, for over 15 years. Once in a while, about once a year I would get wild and do this type of color. I used to think it was so ” out there” but now, it’s just another Saturday Mornng! This is packaged so nice, I didn’t want to open, but I couldn’t wait to see what was waiting for me. I’ve only opened a couple of doors, the first one has the saying “Fly a Kite”, each door has different sayings. One door had a nail care tip. I will share those with you as I use. Thank You so much, Diana! I adore this present, it’s even more special because it is from you. I am so thankful for my friends on You Tube, and from this blog, I don’t have the words. I am so happy we became friends, you are a very special person, Thanks for being my friend.. That is the best gift of all! 👀 Look what came in the mail today. 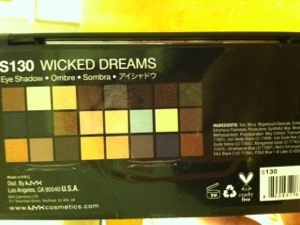 NYX Wicked Dreams Eyeshadow Palette. It’s a gorgeous palette. 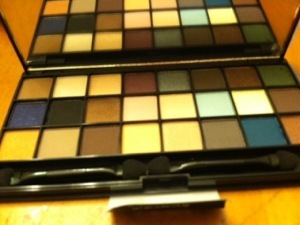 But first, I have to tell you I won this palette in a blog giveaway. One of my favorite blogs, Beauty In A Budget, please check it out, I promise you will like. 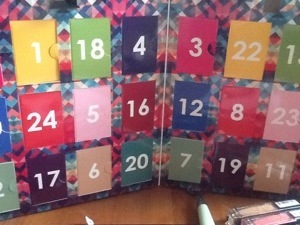 This is the back of the palette, showing all 24 colors. These colors are Ga-Morge-Ous!. Yes, I made up a new word. I know my iPad camera is not the best so I took these pics with my new phone, but even with the HDR setting, the vibrancy of these colors still is not coming through. So Pretty! It looks to me like 13 of these shades are matte, there are some shimmer-y shades and 2 gorgeous shimmer/glitter in blue and green. 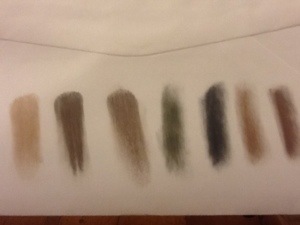 A few swatches. The first 3 are some brown matte shades that will look pretty on my blue eyes and I might be able to use on my eyebrows as well. The next 2 are the bright green and navy blue, the navy one has sparkle to it, and the 2 on the end are a copper brown that I think will also look good for my eyes. 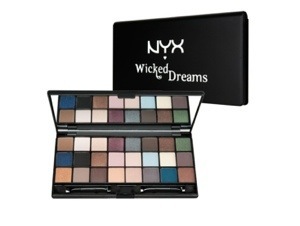 The Wicked Dreams palette from NYX retails for just $15 and can be found here. 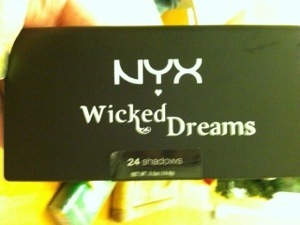 Anyone who reads this blog or watches my You Tube channel knows I love NYX products. I just wish they were sold in my area. Whenever I get to an Ulta, the first section I head to is NYX. I found the NYX Matte lipsticks this summer, and I still love them. Merlot is my favorite color and I’ve almost used an entire tube in about 4 months. Considering all the lipstick I own, that shows how much I love it. I’m excited to try this palette and I will do a full review soon. I want to thank Teresa at BudgetInABeauty Blog for hosting this giveaway and I want to thank Jeff at Blue Scandal for sending the palette to me. This will be fun. I can’t do a blog post without a NOTD. 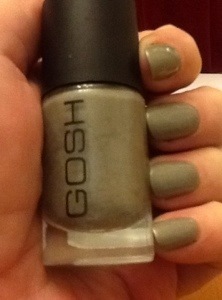 This is the other Gosh polish sent by my Secret Santa, called Drizzle. So pretty, after all the red, navy and glitter of the holiday I’m liking the green creams right now. 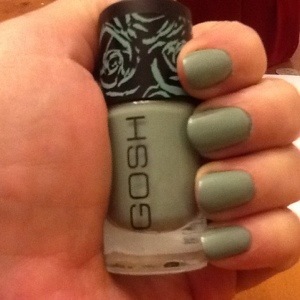 The formula of this Gosh polish was just like the other Gosh polishes I have. It’s a good formula, easy to work with. It looked fine with 1 coat, but you know me, I put on 2 coats. 💅 Gosh Cosmetics is a Denmark company, they do ship worldwide and will ship to the states for a flat rate fee of $6.95. They have a full line of cosmetics, not just nail polish. Some of my favorite colors from Gosh are Miss Mole and Purple Heart. Miss Mole is a medium brown with the same charcoal stripe running through the bottle. Purple Heart is a deep purple, that has a green shimmer in the bottle, but it does not want to transfer to the nail. It’s still a pretty polish. 🚑 With a flat rate shipping fee it wouldn’t be a bad idea to get with some friends to place one order, then you could divide up the shipping. 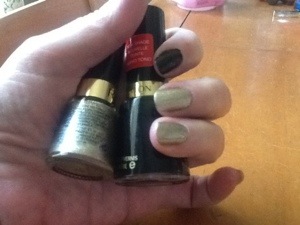 Even those these are drug store polishes they are a bit more than usual. These are $9-10 each from what I’ve heard. I have not shopped on their website, you can find them here. Let me know if you do order, and of course if you were happy with the service. Some of you may have noticed the Blogger’s Secret Santa icon on my blog page. I signed up to be a part of this years Secret Santa. It was for bloggers only and the idea was to send something nice to your chosen person for around £10 or $16. It was cheap and cheerful, just like me and I enjoyed being a part of. 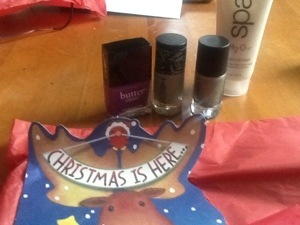 The Secret Santa was hosted by Erin at 365 make up, a big Thank You to Erin. 🚑 When my mailman first showed up today, the only thing she brought was a jury summons. Every January for the past 6 years I get picked? I have a theory about that, but I won’t go into here. A few minutes later she came back with a package. It had a customs form on it. I’ve been expecting a package from my friend Diana, who lives in London. But to my surprise, it was from my Secret Santa. 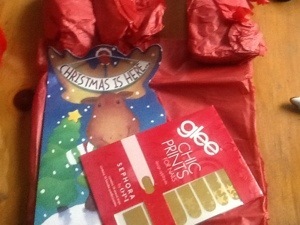 I am so excited by the presents my Secret Santa sent! 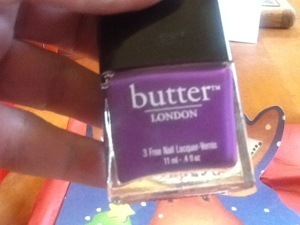 She sent me a bottle of butter London Brummie, vibrant purple. Looks similar to Play Date from Essie, but richer, deeper purple. I don’t have anything like this color! Gosh!. I love this brand, I have a couple of bottles, but nothing like these colors. They are gorgeous colors and I can’t wait to wear. I don’t know which one I’ll try first. 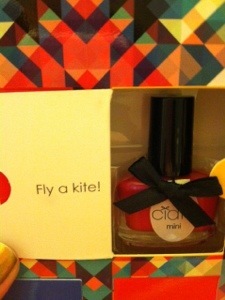 I may have to do one of my half & half manis for these. 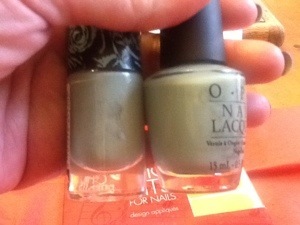 On the left is the color Drizzle and on the right, Fossil Grey. I don’t have anything like these. 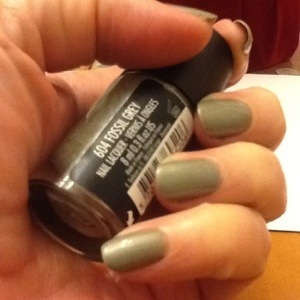 Drizzle is a muted green, OPI Thanks a Windmillion, from their Holland collection is similar. The Gosh polish has a bit of a darker vein running through it. I hope you can see in the photo. I just painted my nails with Estée Lauder Black Sapphire, but I’m going to paint them with one, or both of the Gosh. She also sent a nice size tube of spa H2O hand and nail cream. I put some on and it smells great. The formula sinks right in and left my hands feeling soft. I have been shaking and squeezing in my tube of Barrielle hand and nail cream, so this was perfect timing! I don’t know if I’m allowed to reveal who my person I sent presents for, so I will hold off until further notice. It wasn’t Shayna, I know she’s waiting for her package. It will be fun to see everyone’s posts about this years Blogger’s Secret Santa! Did you participate in a Secret Santa this year? I think they are always F-U-N!! I received 2 notices today of new collections announced by CHANEL and butter London. ** big sigh**. butter London Sweetie collection is available now on their website. The colors are all pretty soft and pastel. Look for quite a bit of these soft, pastel colors this coming spring. 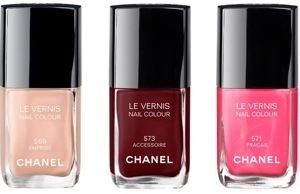 CHANEL Spring 2013 will be available January 2013. 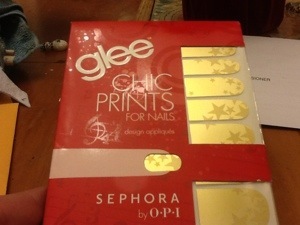 They have 3 new nail shades. Emprisse, Accesoire & Fracas. To me Emprisse and Accesoire look very familiar. Emprisse looks a lot like Beige from their Fall 2012 collection and Accesoire looks like a bit deeper shade of April (revlon Raisin Rage) from their Spring 2012 collection. Fracas, I’m afraid, looks interesting. I love the bright pink look of this one. You can find CHANEL at CHANEL’s website or my favorite store Nordstrom. At Nordstrom’s website you need to put CHANEL into the search bar because no CHANEL products show up under their regular beauty tab. CHANEL Spring 2013 Beauty Collection. This is a picture of all their new products for Spring 2013. The have new lipsticks, new rouge velvet, new eyeliners, new nail polish, new eyeshadow quad, new blush and a new face powder. Of course, the entire collection looks gorgeous. I love that CHANEL has been featuring the camellia flower in its advertising. This was Coco Chanel’s favorite flower. I have small camellias on my glasses, with little bitty C C’s, and I love the little flower logo. It is my favorite logo from CHANEL. I’m really trying not to buy any new polish. I want to wear and use what I have. Since I basically went a bit insane buying polish the last few weeks, I do not need any new polish. I’m going to try to abstain. Are you going to buy any new polish in the new year? 🎄 I hope you all are having a good holiday, I know not everyone celebrates Christmas, but I just hope everyone gets to spend time with those they love. For me, that is my kids and my family. 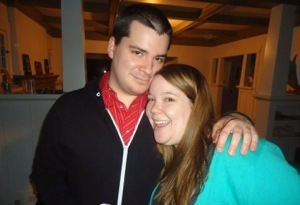 I got to see my sister tonight. This is their holiday card. 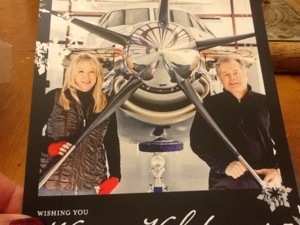 Her husband owns an aircraft company, that’s why they are with his new plane he just bought and loves. 👫 I’m sure many of you guessed my news from Jilly is, she is engaged!! It’s official! I’m so happy for her and Bryan. He is a very special boy man. The best thing about him? He worships and adores my daughter. I believe he loves her as much as I do. I wasn’t allowed to tell until she could get the news out, but funny thing while I was at Costco the other day, everyone I saw congratulated me on her engagement! So, I guess she has announced to who she wanted and now I can tell everyone! 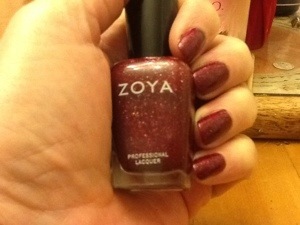 Zoya Blaze is my #5 Holiday Manicure pick. I had on CHANEL Skyline which I love, but I’m wearing black and white tomorrow so I thought this red would be pretty. I really do love Zoya polish. I always forget how much I like it, until I use it. ⛄ What plans do you have for tomorrow, if any? And what’s on your nails?